Don Jackson, the 1962 World Figure Skating Champion from Canada, co-founded Jackson Skate Company with his brother, in partnership with the Bauer Skate Company. Jackson Skates are worn by figure skaters of all ages and all levels and are one of the most popular brands of figure skates in the world. Riedell skates have been around since 1947, and they remain industry leaders for quality figure skates. We can also special order other brands, including Klingbeil, SP Teri, and more! Hockey players want the boot that will give them "an edge" over the competition. 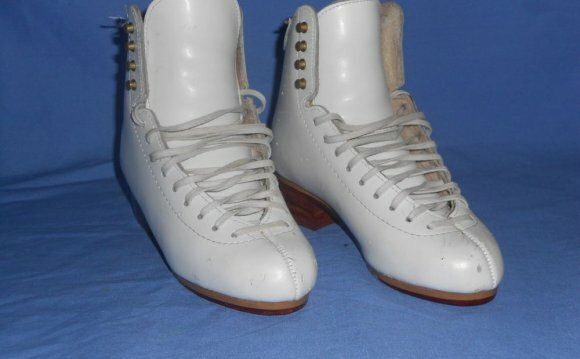 We will help you get the best fit, and we can special order skates upon request. Buy the best blades for your skill level. There are different styles and lengths and radial measurements. Ask our professionals which blade would be best for you! Our pros can also keep them sharp for you! A skating essential! Under-the-boot, over-the-boot, either way... they help you look your best in your favorite skating outfit. Blades need to stay sharp to give you the best edges, and blade guards keep your blades from getting too dull too fast. Your blades will last longer, too! Keep your blades dry and clean with soakers to cover your blades. Now available in extra puffy styles and extra fun colors and fabrics! The Robert Unger School of Ice Skating logo printed on miniature Coffee/Tea Sets, china plates, and china cups.